Effective deterrent that delivers 1,000,000 volts! Constructed of aluminum alloy for strength and durability, the ZAP® Rechargeable Stun Gun Light shows assailants who's really in charge. The zap sound, made by triggering the Stun Gun, is more than enough to deter attackers from making another move. If it's not enough, the 1 million volts of Stun Gun force will definitely have them wishing it had been. With rubber grips and a wrist strap, you don't have to worry about losing your grip or having it wrestled from your grasp. Plus, the glow strip allows you to easily find it in the dark for those late-night visitors. The safety on/off switch adds protection for accidental discharge, which is always a good thing. The ZAP® Light comes with a wrist strap, wall and car charger, and a carrying case. But it's also a flashlight. The ZAP® Light keeps you safe in all enviroments, and it can also light those dark corners. The 90-lumen Flashlight lets you see when someone is coming toward you, giving you ample warning to make a move. The Flashlight can run up to 5+ hours on a single full charge and the bulb is made to last a remarkable 50,000 hours. Plus, the ZAP® Light stays charged on stand by mode for up to 3-4 months, meaning you're always equipped, no matter what comes at you. 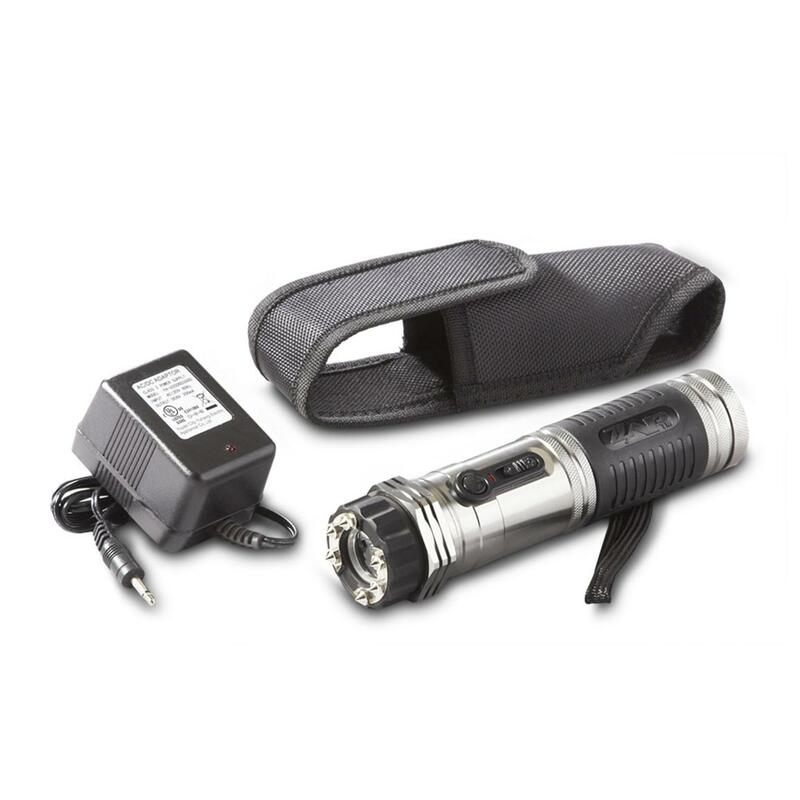 Dimensions: 2.25" x 2" x 6.5"l.
ZAP Light 1 Million Volt Rechargeable Stun Gun Flashlight is rated 4.8 out of 5 by 59. Rated 5 out of 5 by Chris from Amazing Zap Light! 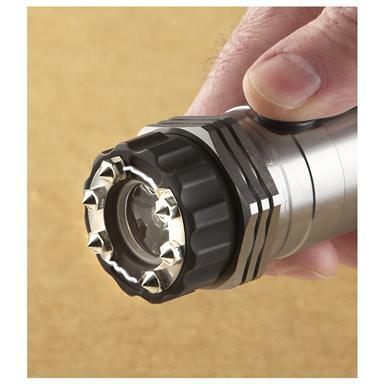 Great flashlight with a major punch. Nice size so that it will easily fit in a purse or glovebox. Decent light and then an amazing zapper that when actuated will even startle the operator. Easy to use controls. I have purchased these lights for my family. Rated 5 out of 5 by OldManAcrossTheStreet from Truly Shocking Light I got the flashlight/stun gun for my wife who walks at night sometimes. The light is great and the sound of the stun gun has already been effective in scaring a dog. I would not want to be on the receiving end of the Stun Gun it sounds powerful. I am sure it would be useful if she was attached. She likes having the option of not having to use deadly force. Rated 5 out of 5 by GEORGE from Great product, well made-i don't have to carry my pistol everywhere we g; We feel SAFE!!! Rated 5 out of 5 by GERALD from Bought as gift for daughter, whose work takes her into possible trouble spots. Rated 5 out of 5 by DANIEL from Nice bright combo flashlight & stunning capabilities...The crack in the air will scare anyone...Impressive..!!! Rated 4 out of 5 by WILLIAM from She LOVES it. She has it with here all the time, & when I saw all the time, 24-7 it is at the head of the bed. I am so afraid that one night & one bad dream = A very bad awake up call, more like a scream. Compact design is just 4.7"l. x 1.25" dia.